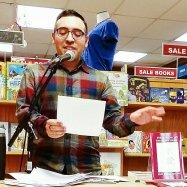 Dr. José Angel Araguz is a CantoMundo fellow and the author of seven chapbooks as well as the collections Everything We Think We Hear (Floricanto Press), Small Fires (FutureCycle Press), and Until We Are Level Again (Mongrel Empire Press). His poems, prose, and reviews have appeared in Crab Creek Review, Prairie Schooner, The Windward Review, and The Bind. He serves as an editor for the journal Right Hand Pointing and is on the editing staff of Airlie Press. He runs the poetry blog The Friday Influence and teaches English and creative writing at Linfield College in McMinnville, Oregon. 2015 RHINO Poetry's Editor's Prize: "Joe"
(Don’t Look Now I Might Be Mexican by José Angel Araguz) That was the title of the book in my dream. I was on the cover, black hair slicked back into grooves, like a record with sunlight needling off. The Mexican flag lay across my chest in a slant, slung over my shoulder like I had won a contest. I had on a blue blazer, khaki slacks, and yellow shoes. I hear the Colombian girl I work with say: You look dressed to ask for a loan. Ready to get that taco truck? No, I am here to tell people about eighteen-wheelers, families as cargo, caught, stunned to have to go back. ¿Que te crees? I want to tell about La Llorona by the side of a river so distraught from losing her child she became a myth. Why the banana shoes then? Not banana: my feet are the color between stop and go. Is that why you’re not smiling? I look back at the photo, see my head hanging over the green, white, and red. Is it shame or defeat that radiates like sunlight at my feet? I could be La Malinche. I could be my father with a son he threw into the ocean. I could be my mother with a son of postcards and phone calls. Did I say it right or are those shoes made of straw, am I to be heretic in this crusade of borders and kin? Your ghosts are women crying over dead children? Isn’t that everyone? I tell her there is no river deep enough to slake the thirst of a land too dry for neighbors. She laughs. It’s raining, it’s always raining. When rain hits a river, all it does is disappear.